REUTERS/Vasily FedosenkoA bird on a solar panel at a solar power station on the outskirts of Simferopol on March 25. 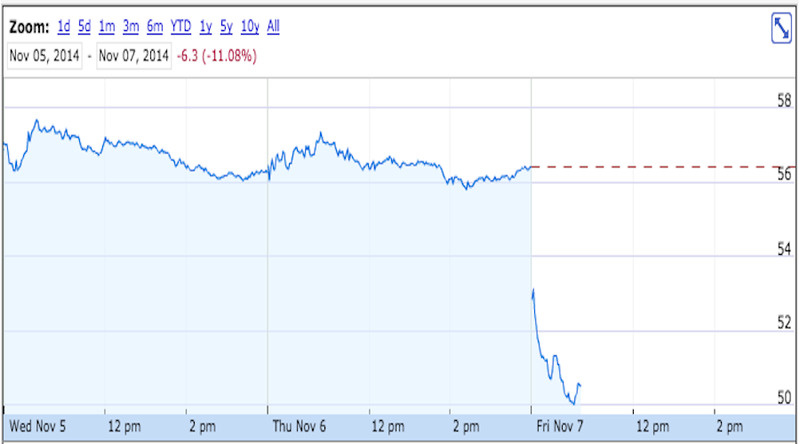 First Solar stock is crashing. 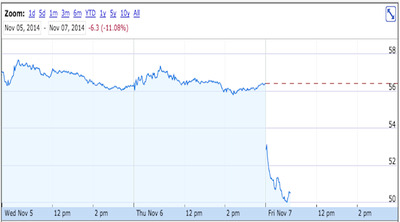 In early trade on Friday, shares of the company were down more than 10%. On Thursday, the company reported adjusted earnings of $US0.61 per share on revenue of $US889 million, which was down from $US1.26 billion a year ago. Investors also appear to be discouraged by comments made on the company’s conference call by CEO Jim Hughes, who said the company was not prepared to file a registration for a YieldCo, a separate entity that would manage First Solar-installed solar projects and pay out a majority of its cash flow in the form of dividends. Finally turning to the often asked question of the YieldCo, the company has determined that we are not prepared to file a registration statement and pursue a listed yield vehicle at this time. However we have also determined that the ownership and operation of whole or partial interest in select solar generating assets does have a role as a component part of our overall business model. We will continue to develop generation assets in the US and select other markets and at times we will retain either a whole or partial interest in such assets. As with any asset class we will continue to evaluate our options for the capitalisation and governance of such assets. The biggest disappointment out of the earnings call was management’s decision not to pursue a public yieldco, even as it grows bookings and plans to hold more self-developed projects on its balance sheet. While we understand that this approach gives FSLR more flexibility as it can still own part or all of the retained projects, we believe a yieldco would ultimately create more shareholder value. 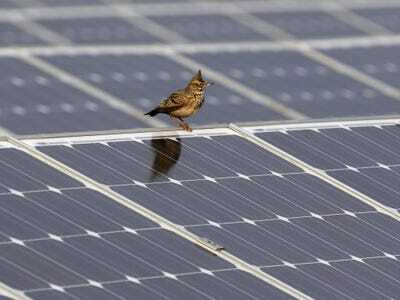 On Thursday, First Solar also cut its 2014 revenue outlook, to $US3.6 to $US3.9 billion from $US3.7 to $US4 billion, while reiterating its earnings per share guidance of $US2.40 to $US2.80. Year-to-date, shares of First Solar are down about 7%. Here’s the ugly chart of First Solar’s drop Friday.